Yvonne Strahovski as the embittered Serena Joy. Spoilers ahead for the sixth episode of The Handmaid's Tale! One of the questions that has lingered over Hulu’s adaptation of The Handmaid’s Tale since it premiered has been who this version of Serena Joy really is. In Margaret Atwood’s 1985 novel, the Commander’s wife is an embittered older woman, all but estranged from her husband, resentful of Offred’s place in her home, and trying to bury her past as a Tammy Faye-esque televangelist. As played by Australian actress Yvonne Strahovski, the Serena Joy we meet in showrunner Bruce Miller’s version of the dystopian Gilead retains the bitterness and resentment, but she’s younger than the book implies, and for the first half of the season her backstory remains a mystery. Wednesday’s episode, “A Woman’s Place,” finally reveals the character’s past. In flashbacks, we learn that before the oppressive regime toppled the American government she was an author—the episode takes its name from her best-selling book—and, along with her husband, was intimately involved in the movement that lead to the establishment of Gilead’s brutal theocracy. TVInsider spoke with Strahovski recently about these new insights into her icy character. Obviously, there are no simple characters on The Handmaid’s Tale, but your character is more complicated than most. What’s it like trying to play all of those different levels in each scene? Yvonne Strahovski: Oh god, have we got two hours? [Laughs] I share the same sentiment. I find her to be very complicated, obviously. Which was also one of the reasons that attracted me to her in the first place. She’s probably someone that I don’t really relate to at all, so to try and sort of get rid of all those brutal, on-paper bitchy levels that she has and try and get right down to the nitty-gritty of what drives her, that was quite the task. And a continuous task as we shot throughout the whole season. But there’s a bunch of things that I feel contribute to her complex nature. For example, being one of the original architects of the society of Gilead. At which point did she lose her voice in that discussion? Especially as a woman. She got her rights taken away from her as well, to a degree. So you’ve got this love/hate relationship with present-day Gilead—as we see it “today” as an audience. She struggles to negotiate the fact that she did play a huge hand in creating it, versus how it’s oppressing her and making her feel—and what it’s doing to the people around her. I feel like she’s also trying to survive within these parameters. There’s a scene in “A Woman’s Place” where we see her giving up her old wardrobe, all her clothes. It’s subtle, but you can definitely tell that she’s conflicted. Yes. It was important for me anyway to try and add that element. I’m so glad you saw it, because prior to that there is what I call the turning point scene in that episode. It’s kind of a small scene, I guess, in the grand scheme of things, but it’s very significant. It’s the one where she’s preparing her note cards. She’s alone in the hallway, and she’s about to make a speech. And the Commander [Joseph Fiennes] comes out and says, “Actually, they don’t want to hear you speak.” And for me, I wanted to make that be the first time that she was told no. I wanted to make that the beginning of how we meet Serena now, when you first start the show. I think it’s a really important scene for both the Commander and Serena, because you see the Commander sort of turning his back for the first time on his wife, who previously had a huge voice in their relationship, and in their dynamic in general. Serena was the one that often controlled the situation and took charge. Serena Joy (Yvonne Strahovski) prepares her notes for a pre-Gilead speech. You do still get hints of that in the way she tries to direct him at times—particularly when they’re prepping to meet with the Mexican ambassador. I think in those scenes it’s more like…in a way she’s testing the waters. We know now, after seeing that episode, that their dynamic was freer and more conversational when Serena, as a woman, was also allowed to take part in that kind of work and read books and be a spokeswoman. But I feel like when we meet them they’re so far away from each other, so disconnected, that every so often Serena tries to maybe throw that in. Also this episode is kind of a reflection for her on how it used to be, and maybe she can test the waters a little more. There’s that beautiful scene in the end of them actually connecting for the first time in a really long time, which is, I think, really pivotal after a lot of rejection. One thing constantly came up for me with Serena: She’s suffering a lot of rejection from the Commander. There’s that attempt in the previous episode, Serena trying to help him [during the Ceremony] and he didn’t want it. There’s rejection of connection even with Offred [Elisabeth Moss], you know? She rejects her. Even on some weird level, if they wanted to connect, there’s rejection and a lack of connection. So there’s this constant theme coming up for me. One of the things that the show does is show us more of this world than the book. We see that not all the commanders’ wives are as cruel as Serena. Why do you think she’s so bitter? I thought a lot about this. Given her background and what might have happened with the previous Handmaid—why the chandelier isn’t there, what had happened between that Handmaid and the Commander—I think there was already a lot of lost trust between them. Add on top of that, you know, by law them not being allowed to touch or be intimate, and not really allowed to talk about work or politics—he’s stripped away a lot of trust and a lot of relationship identity. I think that really serves the bitterness that she has as a character. There’s a lot of raw emotions to do with that. You mentioned the fact that at the end of “A Woman’s Place,” Serena and the Commander reconnect. I wonder how that reconnection drives her story and their relationship from here, whether it was just a momentary thing. Well…I don’t know if I’m allowed to talk about it. I mean, there is a book, obviously, that we’re following. [Laughs] So, anyone who’s read the book kind of knows. But this is an element that isn’t actually in the book, the fact that Serena and the Commander are connecting. So…I think all I will say is that I think the fact that he reaches out to physically connect with her and acknowledge her as an amazing woman I think means the world to her. In a world where she is so empty and there is not a lot left to fill those voids, he offers her a fill in that moment. And I think that is very powerful for the moment. However right or wrong it is, I just think the overwhelming factor is the emptiness and rejection is momentarily fixed. Back to her involvement with the movement that eventually establishes Gilead. I think in her case more than anyone, the biggest question is, how did she let it get this far? Is that something you thought much about? Yes, that was a huge question on my mind. What woman would agree to this? Especially, that came up for me whenever we had a Ceremony. Even though this is a society based on these characters having so much faith in their religion, their whole belief system, I had to ask myself every time: Despite all of that, what woman is gonna sit here during this ritual and not feel affected by this negatively? Which made me wonder, at what point did she lose her voice in this story? And this is just me speculating as a person because I had to try and figure this out for myself, but it does seem to me like she wasn’t a voice in how that Ceremony ritual was set up initially. I think for Serena, the intent initially—anyone who wants to change the world has some kind of a pure intention to begin with. I think. I would hope, right? I feel like her thing was, there are no babies being born. We’re in an incredibly dire state. We need to save the world. We need to have more babies. I think it was as simple as that. I think her whole ideology was based around trying to inspire women to just purely follow their biological destinies. We have the capacity to provide children, so that should be our primary thing that we’re doing from now until we get the world in a better place and repopulate it and make it healthy. She says in that scene, “We should make reproduction a national imperative. We should make it compulsory.” And I think she was very much rooting for that concept. I just don’t think she was there till the very end in deciding what that actually meant in real life versus on paper. There’s an interaction between Offred and the Commander that I don’t think is in the book where he asks her what there is to live for besides her biological imperative, procreation, and she says love. Do you think Serena Joy believes that love is something worth living for? I think she did once believe in love, and I think we see that. I think she was in love with the Commander. I don’t think that that is in the forefront of her mind when we meet her. It just seems like she’s really just trying to get by, given the current circumstances and the lack of connection. And the other thing that gets throw into the mixture is that Serena is abusing her power, latching onto that as an outlet. She’s disempowered as well, and that’s the only way she can reclaim some power. Serena Joy (Yvonne Strahovski) turns her icy glare on Offred (Elisabeth Moss). You’ve mentioned the characters’ disconnection and alienation a lot. This is a show about repression, so everyone is playing a character who isn’t really expressing what they actually feel. What’s it like on set with everyone playing repression? Her backstory is significantly different in the show. She’s an author as opposed to a televangelist. Do you have a sense of why that was changed? Yeah, that was a very early conversation, and a brief one. I think Bruce Miller wanted to sort of just make it feel a bit more modern. I think that was just a decision to try and make the story feel a little more current, whereas the televangelist thing maybe felt a little dated to him. Are there any real life political or cultural figures that inspired this version of the character? No. We didn’t talk about that at all. You can create headlines in really general terms about who Serena is. And for me, that was going to be very distracting if I sort of focused on that side of it—or even watched the movie, how someone else might have played her. That would have been very distracting from me just trying to peel all those layers off. I just wanted to get down to what the heart was here. What really drives her as a human? So I really steered away from anything like that. Did you have any conversations with Margaret Atwood about the character? I didn’t, no. I met her, but I didn’t really get a chance to talk to her. I spoke a lot to Bruce about Serena, but not Margaret, no. 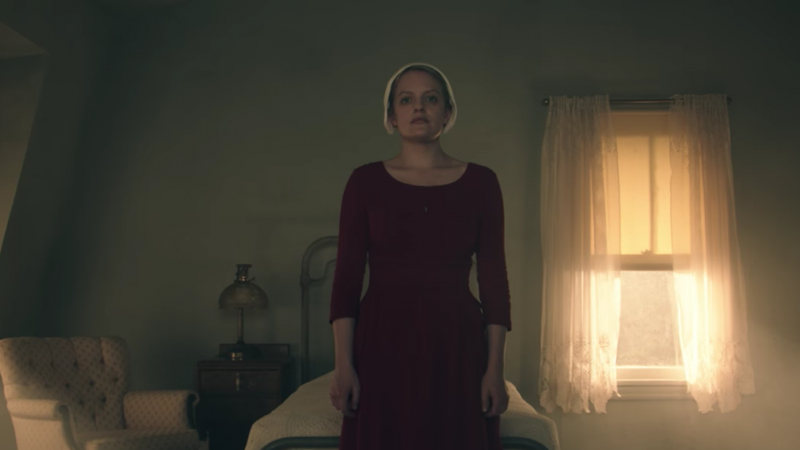 The book, the podcasts and other ways to delve into Margaret Atwood's classic story while waiting for the next episode of Hulu's dystopian series. When I see photos of the cast together, I always wonder what the conversations are like when you’re all together. The show is so lauded and so topical right now. What do you all talk about amongst yourselves? Well, I think there’s just obviously a general excitement about the impact of the show and how exciting it is to really be part of something that is not only really entertaining but also goes beyond the bounds of good entertainment and goes into this territory of, Wow, this is really meaningful and topical right now. I think that’s the most exciting thing about it. And it’s been so accidental as well. I don’t think anyone could have predicted the timelines sort of aligning so much, the release of the show and American politics, the Women’s March. It just seems really eerily aligned.